Targa Australia run the world's largest, longest and hardest tarmac rally event- Targa Tasmania. The concept of the Targa is drawn directly from the best features of the Targa Florio, Mille Miglia, the Coupe des Alpes and the Tour de Corse. However, Targa Tasmania is not a slow motion re-run; it is a genuine "red-blooded" motorsport competition. 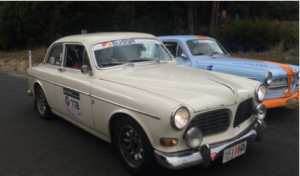 2016 marks the 25th running of Targa Tasmania, a six-day road race around much of the apple isle. The rally is modelled off of the Targa Florio, an open road endurance race founded in 1906 and held in the mountains of Sicily near Palermo. Those first races consisted of a tour of the whole island, the track length in the race's last decades was limited to the 72 kilometres (45 mi) of the Circuito Piccolo delle Madonie, which was lapped 11 times. The event was discontinued in 1977 due to safety concerns – cars were becoming too fast to use public roads as racetracks, and population densities and development was making it very difficult to close of large section of roadway to hold a car race. And so one of the last great motoring challenges came to an end……until, in 1992, the birth of Targa Tasmania. Even the most optimistic enthusiasts could not have conceived that such an event would survive more than just a few years: closing down vast sections of public road for unlimited speed racing was a massive imposition on the general public, the roads were twisty and narrow and lined with trees and rock faces or along the edge of deep steep valleys, but is Tasmania, a step back in time in all the good ways, and we’re lining up today in our 1961 Volvo 122s along with almost 400 other cars of various types and vintages to contest 38 timed “stages” around the state over the coming six days. We” for those of you new to following our little adventure, are Andrew White and Ashley Yelds. 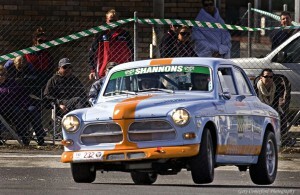 2016 marks our twelfth year of teaming to compete in Targa Tasmania in a car we built specifically for the event back in 2008 / 2009: we took a bare body shell of what was to have been a nice pretty quiet little classic Volvo, inserted a quite extensive safety cage, left off all the bits that would have made it a nice quiet little Volvo and bolted on just the bits that make it a surprisingly quick and effective Targa weapon. Of the seven years running this particular car, we’ve had considerable success, standing on the Classic competition podium six times, with a win back in 2014. The rally this year runs six days around the northeast and northwest of Tasmania, based initially around Launceston then up over to Burnie for a series of new stages, then a loop down to and south of Hobart for another batch of new stages over the last two days. 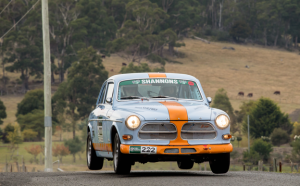 The week long Targa Tasmania kicked off with four competitive timed stages, three of them out in the lovely countryside north of Launceston, the fourth a town stage through the streets of Georgetown. With all the Classic teams now in the one competition (rather than early Classic and Late Classic), it will be a real scramble to see if rather basic cars from the late 1950’s and early 1960’s can take it to mid - 1980’s fuel injected and turbo charged purpose built sports cars such as Porsches and Mazdas. The purpose of the first three stages of Leg One is to get competitors acclimated to driving at high speed on public roads – not that many likely already have some sort of experience in that regard, there is a significant difference in driving flat out on a non- racetrack smooth surface to driving on a roadway that is maintained to suit 60 km/h to 100km/h traffic. Hence, the “Base Times” (the time beyond which penalties are applied) are set quite high, although progressively lowered across the first three stages to up the pace before the full-on blast with the town stage through Georgetown. The first three stages are also a opportunity for competitors to familiarise themselves with a new safety procedure this year; the introduction of “Speed Zones”. These act as virtual chicanes, the goal being to slow competitors ahead of a particularly dangerous piece of road. This requires that we slow to 60 km/h for a moment within a specified stretch of the course, after which we can resume full race speed. Failure to do so incurs a 30 second time penalty, enough to put a team well back from the podium. Leg Two takes us over to the east coast of the island, starting with the Sideling, a 14km favourite stage for us and the Volvo and one we’ve great memories of from Targas past – chasing down a Lotus Exige back in 2008 being particularly noteworthy, especially the part where they skewed off the road, through a farmers fence, flipped onto their roof and careered up the paddock on their roof coming to and end in a chicken shed. That they were being hounded by an old Volvo we are sure had nothing to do with it. This year though was a Lotus revenge: the fantastic little Mewing/Bashi 1965 Lotus Elan S3 took the stage honours, besting the Jensen by a second, the Achertburg Porsche 944 by two, the Hughes Falcon by ten seconds and our Volvo by twelve! We started the day with High Plains, a flowing run through open farmland followed by a steep climb up through a forest before a wild ride down to the valley again through a series of fast and tricky and narrow bends. We “cleaned” the stage (meaning no penalty time), along with the Achterberg Porsche 944, this pulled back our 49 second deficit to the Ulrich’s Jensen to 43 seconds. The Freestone’s though were in full swing in the Aston in third place, dropping two seconds, but hotly chased by the Hughes’ Falcon just two seconds back and the Ulrich’s Jensen CV‐8 only another two seconds back. An under bonnet check of our engine bay revealed a continuation of yesterday’s coolant loss problem – seems to only happen under the full stress of race conditions, not at normal road speed. Something to monitor closely. With our hopes of a podium, let alone a Top Ten placing now firmly dashed, we’ve set our sights on achieving a Top Three place on a number of the stages for each remaining day – the opportunity to drive some fantastic roads, specifically closed to the general public for our enjoyment, is too much to pass up, so we’ll be pressing on running as much of the rest of the event as we can down to Hobart. Our service crew, comprising Phil Watts and Rick Williams (high school mates of Ashley’s) and Barry Brookes (Mr Toperformance – Koni distributor) did an early morning double check of bolts and belts and connections and fluids and tyre pressures and sent us on our way, the car feeling as strong as before. Although we’d not unequivocally solved our coolant expulsion problem, we felt we’d eliminated the one likely cause, that being a faulty head gasket. The replacement gasket being a little thinner, we retarded the ignition timing a little to avoid detonating a piston. Having made the decision to run without using the spare standard spec cylinder head, we’d also decided to run carefully on the first stage to stress test our latest repair, then have a bit of a go at the 100-bends Queenstown stage using a 5,000 rev’ limit and continue on to the mighty 50 kilometre long Mt Arrowsmsith stage, still keeping the 5,000 rev’ limit. This was to “save” ourselves for the Tarraleah, one where we believed we had a chance of setting fastest time....if we got there to actually run it. Heading out of Strahan in the early morning we found the roads a little damp and quite slippery. Even though we set a self-imposed 5,000 rev limit, it was plenty fast enough to find many of the bends quite treacherous. As we’d moved ourselves up through the start order in anticipation of a long slow drive to Hobart (so as not to be too far back in the field amongst the very fast moderns), we were in amongst the smaller capacity Classics such as Fiat Abarth 850’s, Triumph TR2’s, Steyr Pusch TR Europa’s, etc. We ended up feeling quite the bully running them down. The last leg of the event comprises six stages in a loop south of Hobart. With residual concern over our damaged engine, we again decided to just cruise through all but one of the stages, targeting the very last stage, Longley, to chase a fastest time. The eight kilometre long Tinderbox stage was new to the event, and saw the gulf-liveried Wallman/Button Porsche 911 take the win by two seconds over the Ulrich Jensen. Just one second back was the Hughes’ Falcon, with the also-Gulf liveried Cook/Cooper 911 Carrera RS just another two seconds back and equal with the Achterberg Porsche. Good thing we hadn’t formed a Gulf team for the event, our “cruise” through the stage saw us back in 31st The McClintock/Skinner BMW 2002 took up 6th spot ahead of the Aston. The Jensen was now 1:01 back from the lead, holding a 1:05 margin over the Aston. Hot on that 60’s supercar heels were the Hughes, just 21 seconds back in 4th It was shaping up for a tight finish.